The Pony Express was a mail delivery service that ran between Missouri and California. Using the Pony Express, mail could arrive in California in as few as 9 days rather than the weeks it took to arrive when sent by horse carriage. The Pony Express used a planned out route with a number of stations along the way. Riders would carry the mail from station to station, switching to fresh horses at each station. Every hundred or so miles the rider would be replaced. This allowed the mail to be constantly moving at a good speed. The route used by the Pony Express went from St. Joseph, Missouri to Sacramento, California. There were 184 stations along the 1,900 mile route. 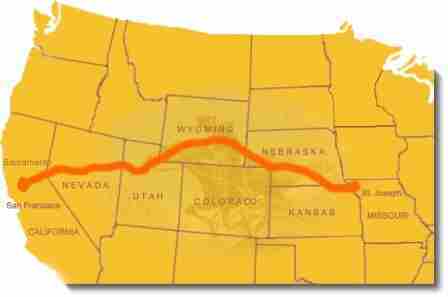 It followed the Oregon Trail for a ways, and then used the Mormon Trail to Salt Lake City. The trail traveled over the Rocky Mountains, the Sierra Nevada Mountains, and finally to California. The riders of the Pony Express made $100 a month, which was pretty good money for the time. They worked hard, riding in bad weather, rough terrain, and in dangerous situations. In order to keep the weight down that the horses had to carry, the riders had to weigh less than 125 pounds. A lot of the riders were young, tough, skinny, teenagers who were willing to face the dangers of the ride for the excitement of the job and the money they could earn. When did the Pony Express run? The Pony Express was a business. Despite its place in American history, it didn't stay open very long. It opened on April 3, 1860 and closed on October 24, 1861. At the height of its business it had over 400 horses and around 180 riders. The Pony Express was forced to close after the opening of the transcontinental telegraph. Telegraphs could be sent much faster and with less expense. In the end, the business venture that was the Pony Express lost a lot of money and became outdated fairly quickly. The first riders left from Sacramento and St. Joseph on April 3, 1860. They each arrived around 10 days later. In the winter, the trip generally took around two days longer than in the summer. The most famous of the Pony Express riders was Buffalo Bill who earned fame putting on Wild West shows. The initial cost to send a ½ ounce letter was $5. That was a lot of money back in 1860. 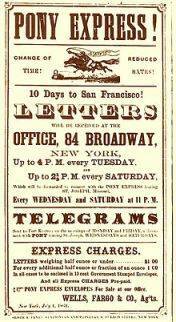 Prices were lowered to $1 for a ½ ounce letter by the end of the Pony Express. Only one rider and one shipment of mail were lost during the running of the Pony Express. Riders would travel 75 to 100 miles a day, switching horses every 10 to 12 miles. The fastest delivery in the history of the Pony Express was seven days and seventeen hours. It was to deliver President Abraham Lincoln's inaugural address. The Pony Express was started by William H. Russell, William B. Waddell, and Alexander Majors.